Japan's plan to turn its 27,000-ton Izumo-class helicopter destroyers into aircraft carriers, a move that essentially changes the warships' nature from a defensive to offensive one, has caused concern among countries neighboring the east Asian nation. Japan must not forget its infamous history of invading countries and regions in the Asia-Pacific region during the WWII, as making an aggressive move like this may drive the country to repeat its militaristic history, experts said on Wednesday. Japan will write the plan into its latest National Defense Program Guidelines at the end of the year, Japanese Defense Minister Takeshi Iwaya announced at a press conference on Tuesday, Japanese newspaper the Sankei News reported on Tuesday. Song Zhongping, a military expert and TV commentator, told the Global Times on Wednesday that Japan's move means a fundamental change in the vessels rather than a simple boost to their combat capabilities. "As helicopter destroyers, the main mission of the Izumo-class ships was to run defensive anti-submarine tasks. However, becoming aircraft carriers means that they are offensive platforms capable of attacking maritime, air and land-based targets," Song said. The Japan Maritime Self-Defense Force now operates two Izumo-class helicopter destroyers, the Izumo and the Kaga. However, Western media tend to tone it down, saying that Japan might need aircraft carriers to simply protect its interests and not necessary use them in aggressive ways, even providing a pretext that China has been developing aircraft carriers in recent years. "The China threat theory is merely an excuse for Japan to do what it wants," Song said, stressing the vicious acts Imperial Japan did in the past. Under the war-renouncing Article 9 of the Constitution, Japan has maintained that it cannot possess attack aircraft carriers as it is only allowed to use force for self-defense, the Japan Times reported on Tuesday. Song said that ties between China and Japan were restored following Japanese Prime Minister Shinzo Abe's visit to Beijing in October, but Japan is in the danger of risking it. Iwaya also said that the refitted aircraft carriers will carry US-made F-35B stealth fighter jets. Japan will order 100 more F-35 fighter jets, including both the F-35A and the F-35B, Japan's Nikkei News reported on Wednesday. By having the F-35B on its carriers, Japan will be asked to play a bigger role in the US' global military strategy to the extent that Japan might be able to deploy its troops around the world, Song said. This will not only cause tensions with countries around Japan, but also have a negative impact on the world, given what Imperial Japan had done in WWII, Song said. 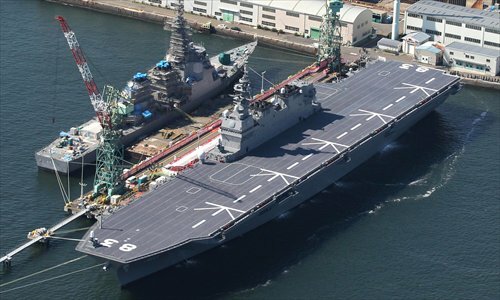 There were reports which indicated Japan's plan to refit the helicopter destroyers into aircraft carriers. Chinese Foreign Ministry spokesperson Hua Chunying said at a regular press conference on December 26, 2017 that China urges Japan to adhere to the policy of "exclusive defense," stay committed to the path of peaceful development, act cautiously in the area of military security and do more to enhance mutual trust between regional countries and promote peace and stability in the region.